It's hard to tell unless you enlarge it, but the background paper has teensy colorful polka dots in bright colors that coordinate with the balloons. I didn't want to go a winter route with the colors or decor on this page. True, there's ice and the kids are in jackets, hats and gloves, but it was 100° outside on this June day and using snowflake paper would have felt really weird. I like how clean and simple the page is. I may have to repeat the design soon, because Trevor is having his 10th birthday party at the ice rink next month! Loveeeeeeeeee this! LOVING the photos and the balloons!!!!!!!!!!!!!!!!!!!!!!!!!!!!!!! The party looks fun, Cindy! You did a great job of capturing it! Fun! Great job with the non-snowflake theme. We live in Minnesota so I get a little tired of snowflakes and titles such as "It's SNOW fun!" (blech) ;) I'll be taking a cue from this one for sure! 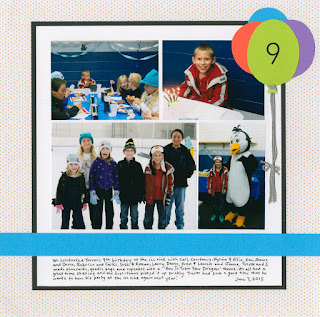 Looking forward to seeing how you capture his 10th birthday at the rinks!